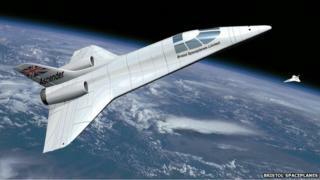 Image caption Could space planes be launched from the UK one day? The government has backed plans for a four-fold expansion of the UK space industry to £40bn by 2030. It is also considering developing the necessary legal framework to permit a spaceport to be set up in the UK. It is hoped that this might see the growth of new space tourism companies to start operating services in Britain. There will also be a simplification of regulations and greater coherence to spur the creation of new space firms. The government made the announcements in response to an industry report published last year called the Space Innovation and Growth Strategy Action Plan. The science minister has been a supporter of the UK space industry and has fostered closer links with the European Space Agency (Esa). He was closely involved in negotiating the selection of Esa's first "official" UK astronaut, Tim Peake. Major Peake will be going into space next year to conduct experiments on the International Space Station (ISS). Mr Willetts said that the space sector could "propel" UK growth. "Space industries already support 95,000 full-time jobs and generate £9.1bn for the economy each year, and our response to the Growth Action Plan shows our commitment to secure its future growth and realise ambitions to develop a viable UK spaceport for commercial space flight," he explained. Dr David Parker, chief executive at the UK Space Agency, said that government was working "shoulder-to-shoulder with industry to exploit the full potential of the space sector to grow the economy, deliver more efficient public services and inspire the next generation". "At the UK Space Agency, we are particularly focusing on helping the rest of government make best use of the huge increase in real-time data from the Galileo and Sentinel satellites, looking at exciting opportunities such as a UK spaceport, and leading an export drive for UK space products and services. "Our vision is to make the UK the most attractive location for space businesses to set up and prosper - and I'm convinced we are on our way." The chief executive of Surrey Satellite Technology Limited (SSTL), Dr Matt Perkins, told BBC News that "the space sector has huge potential and I believe the strong government endorsement of this strategy provides a pathway to achieving increased economic benefit for the UK and growth for SSTL."